It was a cool morning in the mountains, and the heavy rain briefly turned into hail. It was pelting the roof of our lodge, along with booming thunder, which shook the walls. But by the time we finished breakfast, paid our bill and strapped on our backpacks, the rain was just a drizzle. Later in the day, when we walked between temples on the outskirts of Matsuyama city, the rain intensified again, but without any thunder or lightning. Since the distances between the temples were short, it did not make any sense to stop for the day and check into our hotel. Besides, we were already very wet, so we continued to walk. At one point, when the rain had gotten very strong, we took shelter and had lunch in a small French cafe that doubled as an antique store. Most of the items in the store were not actually antiques, just flea market items from France, but somehow in the context of a Japanese city, they looked very charming. The owner told us that she wishes one day to learn to speak French. She made us some very good pancakes with berries and apple and cinnamon, and gave us two homemade muffins as an Osettai (gift to pilgrims) when we left. 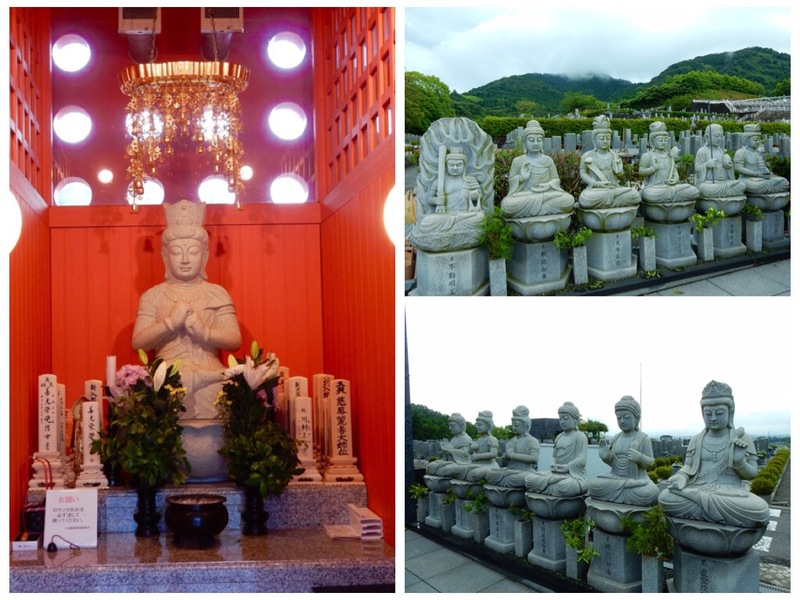 The five temples that we visited today were located at the southern outskirts of Matsuyama city. We could see the city stretched across the plains, and realized how urban and built up it is. Somehow we thought it would be a smaller city. But the Southern temples were located in quiet, small neighborhoods surrounded with rice fields, with nice homes with beautiful gardens and well-designed roofs on the houses. I cannot really say that I felt sad to leave the rural areas we have been walking through, and to enter the big smoke of the city. Our hotel, the Daiwa Roynet, is very new and it feels luxurious to us. We have a rainforest shower, a well-designed Western Style room with nice furniture, clean ironed sheets, a coin laundry and fast internet. The hotel receptionist must have seen how spent I felt, and she showered me with gifts of fragrant bubble bath salts, hair ribbons and clips, soaps, coffees, facial cream and a scrub sponge. Initially she offered me a basket of those gifts and I chose only one of them, but she took out a plastic bag and filled it with gifts for me to pamper myself with. The woman I saw in the mirror as we got into our room, looked tired and pasty. After a long shower and a soak in the bathtub with the fragrant bath salts, I felt refreshed again. We had dinner downstairs at the hotel’s Italian restaurant, which specialized in brick oven pizza, and also had very good salads. It was nicely designed, with a wall of red wines, wooden crates of goods from Italy and waiters and waitresses dressed in clean white shirts and black aprons. The staff welcomes everyone who enters the restaurant with a loud and friendly greeting of: “Buona Sera! Buon Appetito!,” said in a very Japanese accent. The temple was founded by Gyōgi in the year 708, and later restored by Kōbō Daishi. The temple was named Pure Lapis Lazuli Temple because the temple’s main deity, Yakushi, is known as the Buddha of Pure Emerald Light (Rurikō Nyorai). The temple was destroyed by a wild fire in the 17th century, but rebuilt 80 years later by the priest Gyō-on. This man was a successful businessman who at the age of 72, decided to become a mendicant monk. While he was roaming around Shikoku, he noticed that the road between Kumakogen and Joruriji in Matsuyama, was destroyed by floods every year. He decided to raise money and construct eight bridges along the Tosa highway. The wooden bridges he constructed are long gone, but the modern ones which replaced them, still bear the same names that he gave them. In the temple is a stone imprint of the Buddha’s footprints, and it is said that If you stand on the Buddha’s foot prints with bare feet, any pain in your feet will immediately disappear. The temple was founded in the year 701. In Kōbō Daishi’s time, eight paths led up the mountain to the temple and hence the name, the Temple of The Eight Slopes. The statue of Amida Buddha was created by Eshin Sōzu in the 11th century, and the statue of Bishamon-Ten was made in the 13th century. The temple grounds also feature a well preserved stone pagoda (Tahōtō) and a Hōkyō-In style stupa, created at about the same time period. This temple belongs to the Daigo-Ha sect of Shingon Buddhism. On the grounds, there are two small tunnels with beautiful paintings on the walls and a painting of an old naked woman ascetic who is believed to be living in the mountains as an enlightened immortal. Under the Hondo (main hall) there are hundreds of small golden statues of Amida Buddha, donated by believers and devotees. Founded by Gyōgi Bosatsu in the year 741 several kilometers from here. The temple was moved to its present location by Kōbō Daishi in the year 807. Kobo Daishi carved and enshrined the statue of Kannon. As he did at many of the other temples on the pilgrimage, Kōbō Daishi created a spring of fresh water, (called Tsue No Fuchi – Well of the Staff) by striking his staff on the ground. The temple was founded by Gyōgi around the year 709. It was designed as a restful and beautiful place for the Empress Kōken to come and pray. It used to be quite large, with 66 halls and a few affiliated temples. All were burned in 1416 and later rebuilt by the Kōno clan of Iyo Province on a much smaller scale. The Hondō is built in a Chinese style of architecture and contains a statue of the founder of the Nembutsu practice, Kūya Shōnin (903-972). The monk at the Nokyosho office where we got our pilgrim’s book stamped, gave us two good luck charms and wished us a safe journey. Even thought I love it that people wish us a safe journey, by now, I am utterly convinced that no dangers can ever come to us outside of ourselves. If we are ever in danger, it is because our own minds get sloppy and give in to negative thinking, or to wrong mental attitudes. Emon Saburō, the wealthiest man in Shikoku, became a pilgrim in search of Kobo Daishi, in order to ask for his forgiveness. His pilgrimage began here, at Monjuin. I will tell the story of Emon Saburō tomorrow, after we visit temple 51, which is dedicated to his story.